Looking for a fresh take on zucchini that doesn’t involve making zoodles? 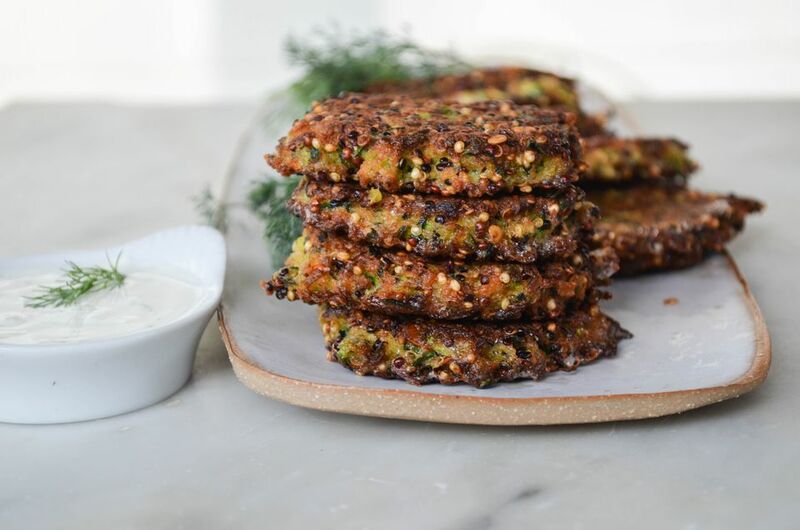 These zucchini quinoa patties, reminiscent of latkes, but without any potatoes, are the perfect family-friendly recipe. Serve them as a side, pack them in school and camp lunches for a wholesome, homemade meal, or double the size of the patties to use them as veggie burgers. Including leftover, cooked quinoa adds a nutritional boost, while also giving a mindful nod towards maximizing your grocery budget and using up every morsel of food. As with making latkes, removing excess liquid from the zucchini is crucial, since they’re naturally high in water. After shredding the zucchini on a box grater, wrap it in a kitchen towel to wring out as much water as possible. This helps ensure your patties hold together when cooking them. Once the zucchini is prepped, the patties come together quickly and easily. You can make the mixture in advance, up to 2 hours before you plan to cook them, and keep it, covered, in the fridge. Parmesan cheese adds flavor, while also acting as a binder, along with eggs, and and Panko breadcrumbs (you can use regular breadcrumbs, too). There’s some red pepper flakes for a subtle zing with each bite. It’s a lovely contrast when eaten with the creamy dill dipping sauce, but feel free to omit the spice for more sensitive palates, or to make them for younger taste buds. To make the dipping sauce, combine sour cream, lemon juice, and dill in a small bowl. Whisk to blend. Season with salt, cover, and set aside in the fridge until ready to serve. To make the patties, place the shredded zucchini in a clean, lint-free (not terry cloth) dish towel. Fold up to completely cover the zucchini, and squeeze to wring out any excess liquid. Add the eggs to a deep bowl, and beat them lightly. Add the zucchini, onion, quinoa, breadcrumbs, cheese, red pepper flakes, parsley, salt, and pepper. Stir until well combined. May be prepared up to 2 hours in advance. Store covered in the fridge. Add the oil to a 10-inch skillet and heat over medium flame until shimmering. Add 1/4 cup of the quinoa zucchini mixture to the skillet (an ice cream scoop works really well here, and dipping your hands in water so the quinoa doesn’t stick is helpful, too). For smaller patties, scoop 2 to 3 tablespoons of the mixture. Use the tip of a fork to flatten the ball into a 3-inch patty. Repeat with the remaining mixture, being careful not to overcrowd the pan (you’ll need to fry them in batches most likely), adding more oil as needed. Cook until golden around the edges and set, 3 to 4 minutes, then flip, and cook until golden all over, 3 to 4 minutes more. Transfer to a paper-towel lined dish to drain.